How do you measure the impact of a program? The Onward to Opportunity program is the nation’s leading career preparation and training program for the military-connected community. To fully understand the reach and impact of the program, we visualized certain program data points to inform interested stakeholders, at a glance, of the program’s activities and performance. From participant outcomes to curriculum data, the O2O Insights dashboard is the best way to get up-to-date and accurate information demonstrating the full scope and scale of programmatic operations and impact. If you have any questions or suggestions regarding the accessibility of this site, or if you cannot access any of the material on our website, please email ivmfrfi@syr.edu, or call (315) 443-3342. Participants and Major Installations: This map shows the location of each major DoD installation where O2O is offered in-classroom [diamonds], along with the geographic distribution of all O2O participants. Try using the map’s zoom tools, to hone in on geographic areas of interest! Universal Positive Outcomes by Location: At a glance, this bar chart shows the breakdown of all participant outcomes achieved at each location and for Online learners. Please note, only one outcome per participant is displayed here, prioritized in the following order: Hire, Certification, Entry into Higher Education, Course Completion. Try the filter tool to narrow down the results by the military connection of participants for more in-depth analysis! O2O Indicators: These program-wide indicators provides a behind-the-scenes look at what it means to run a program at the O2O scale. Note: We report 6-month and 12-month Retention Rates for our program participants who gain employment through the program. We would like to note here that we report only verified retention information, meaning we rely on survey responses, and as such our Retention Rate reflects only those who have responded to verify their retention status. They provide insight into the number of employer partners engaged by the program, the number of major DoD installations where O2O operates, the growing number of learning pathways offered, the total number of participants enrolled to date & the number of cohorts launched annually, and the high level of performance we maintain, via the UPO Rate. Career Tracks & Industry: Use this bubble chart to see the distribution of training track enrollment across career track and industry. Hover over each bubble for enrollment counts and labeling information not automatically displayed. 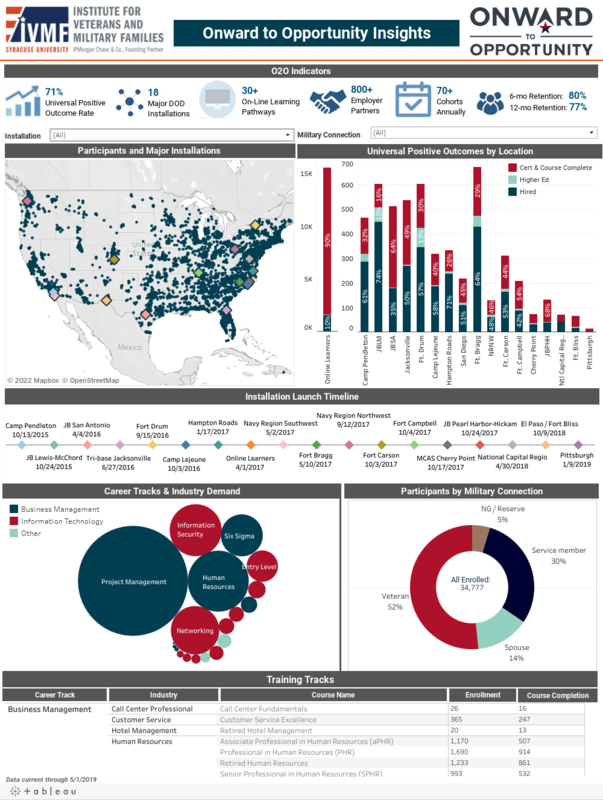 Participant Service Branch: This demographic visual displays the breakdown of service branch for all veteran, transitioning service member, and National Guard/Reserve participants. Installation Launch Timeline: O2O has grown steadily over the past several years – this timeline displays the launch date for each installation’s first cohort, from Joint-Base Lewis McCord and Camp Pendleton in October 2015 to our newest location, Pittsburgh, in January 2019. Training Tracks: This table provides a comprehensive list of all O2O curriculum offerings, their corresponding career track, and the number of O2O participants who have enrolled in that track to date. Scroll down to see the full list of O2O training tracks – tracks are listed alphabetically. Cohort – A class of O2O participants (either in-class or virtual) that start and complete the program on the same timeline and often engage in peer-to-peer networking and study groups. Training Track – The online learning pathway chosen by the participant. Training Tracks are grouped by Career Track. Online Learner – An O2O participant that takes part in the program entirely virtually, either because of personal preference or geographic location. Universal Positive Outcomes (UPOs) – Considering the range of intentions and goals that participants have when participating in Onward to Opportunity, we measure a collection of positive outcomes that represent the full spectrum of ‘successful’ participation in the program. UPOs include being hired, entry into a higher education program, certification, and course completion. Participants can, and often do, achieve more than one positive outcome through program participation.